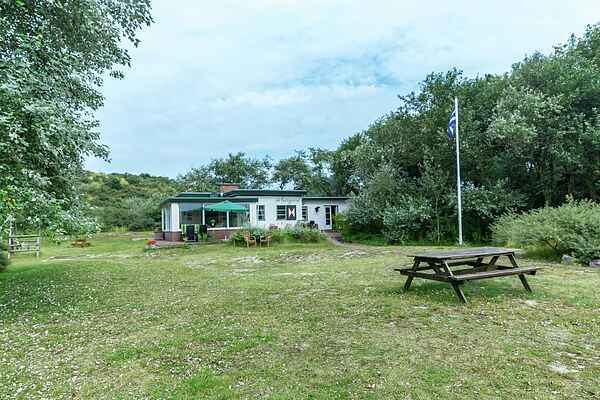 Holiday home Bergeend is located in the middle of the dunes of Burgh-Haamstede in Zeeland. The surroundings are an adventurous playground for children. You can reach the dunes or the beach via a private path. The garden consists of sand, beach grass and shrubs and it is surrounded by pine trees. There is a swing and climbing frame next to the house. From the terrace, you can enjoy a beautiful view of the lighthouse. The lovely conservatory also offers a view of the lighthouse, and the large windows can be fully opened, creating a wonderful sheltered place to sit on a nice day. The living room has a seating area with a view of the dunes and a charming woodburner. All bedrooms have a sink. It is a unique holiday home in a wonderful location where you can enjoy the outdoor life to the full. Particularly nice for nature lovers. Middelburg is certainly worth a visit due to the canals, the Medieval buildings and the lovely shops. Domburg is also a great place to visit with its long beach. Also visit Vlissingen and Zierikzee, both are lovely.